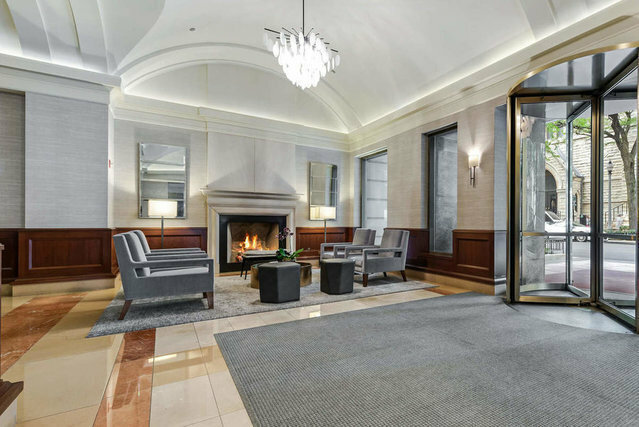 A beautiful, spacious three bedroom home in the heart of Mag Mile -- this elegant space at the Fordham will never go out of style. Three bedrooms, three bathrooms, a cook's kitchen with double oven and pantry; fireplace, crown molding, hardwood floors throughout, balcony, built-out closets -- all the comforts of a single-family dwelling in a prime building and peerless locale. Beginning at dawn, northeastern exposure lets in light and the most desirable views of Chicago's cityscape and lake. The Fordham is a full-amenity building that leaves nothing to chance: from the wine cellar and library below to the indoor pool, hot tub sun deck, exercise room, hospitality suite, movie theater, dog run, full-time doorstaff and one of the city's most elegant lobbies, everything is designed for maximum convenience, with food shopping, Michigan Avenue, the CTA and State Street all mere steps outside the door. Don't miss this opportunity to reside at the epicenter of the Mag Mile!